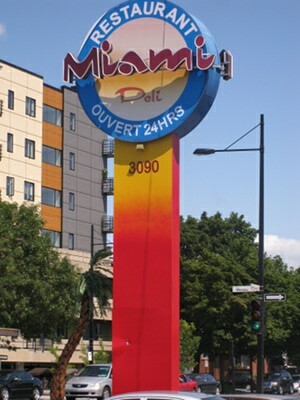 When you get to Miami Deli you will notice a large parking lot with accessible street parking as well. At peak hours the parking lot can get full but you can find something close by without a problem. When you get out of your car you will notice a large terrace, wheelchair parking up front and wheelchair access inside which is much appreciated. The inside is enormous with enough space guaranteeing a spot to sit and most of the spots are really well lit letting in lots of sunlight on those nice sunny days. 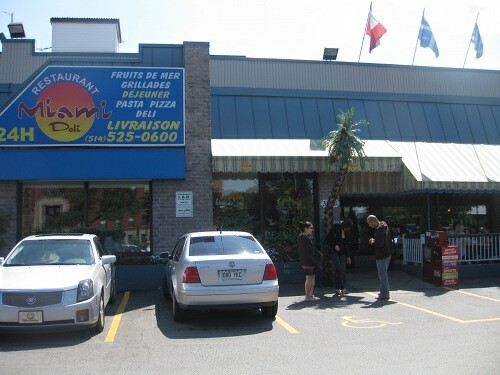 The inside is clean and has lots of tables all around with a diner-esque layout. The menu is quite interesting in that it has everything you would expect from a 24/7 deli-diner with lots of eggs, pancakes and decent size portions but then they surprise you with a health menu item ($5.99) where they even state the calories (360 if you are curious). This “diet platter” item is located right under the 2 eggs and bacon plate which makes it even funnier how you get a healthy option under a less healthy one. The menu size is quite large although still manageable. You can get some well-priced items overall with some plates between $5-$8 then in other sections the price becomes higher and settles in the $10 range. You also get free refills in the form of a carafe placed on your table, which allows you the freedom of having a refill whenever you want and not having to wait for someone. This is a great deal seeing as how places like this can become heavily crowded on weekends and the waitresses / waiters can get tied down pretty easily. Three of us ordered healthy options with 2 of them splitting one plate. 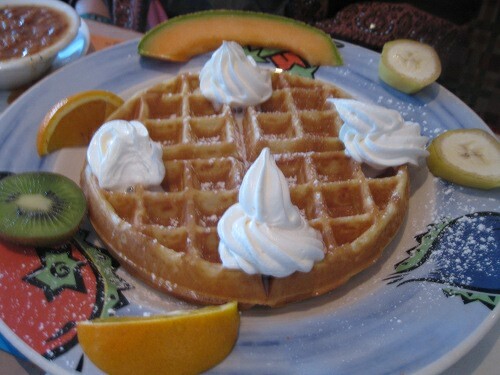 We had the fruit waffle ($8.49) and a poached egg ($4.59) on the side. The waffle was good but the fruit was lacking. 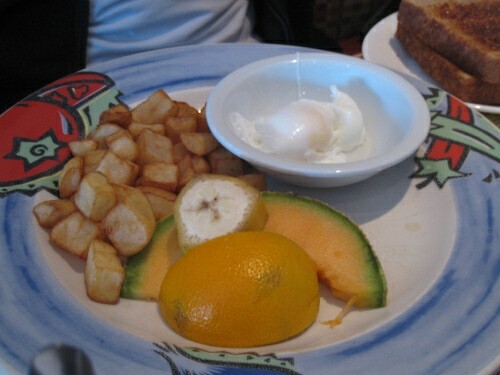 In fact if you look at the picture you can see two banana slices, an orange, a cantaloupe and a kiwi slice. I find it hard to explain how you would call something a fruit waffle and not offer an adequate amount of fruit. Not to mention, it was topped with whipped cream and sugar, which while there’s nothing really wrong with that except for the fact that a fruit waffle implies some kind of fruit/healthy option but that’s just my opinion. One of my other friends ordered the healthy option, which consisted of a poached egg, banana slice, orange slice, cantaloupe slice and potatoes. The poached egg was, well, a poached egg – it’s hard to mess that up. The potatoes were small cubes and were not very tasty. I would even go as far as to say that they were missing taste in general. 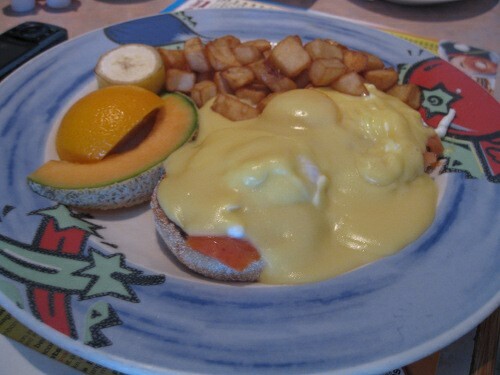 Next came the eggs Benedict with Salmon ($12.48) a side of beans ($1.99) and toast ($1.50). The hollandaise sauce was a bad kind of thick which was not very tasty and took away from the salmon and egg. I was disappointed on the fact that the fruit on the side was the usual banana, cantaloupe and orange wedge, and the potatoes were those cubed ones that were not that great. I was also disappointed that the dish did not come with bread but rather it had to be ordered as an extra. I find that this is quite unnecessary and it should have been included. I mean, you’re paying a little over $12 so the least that could have been done was to give some free bread. 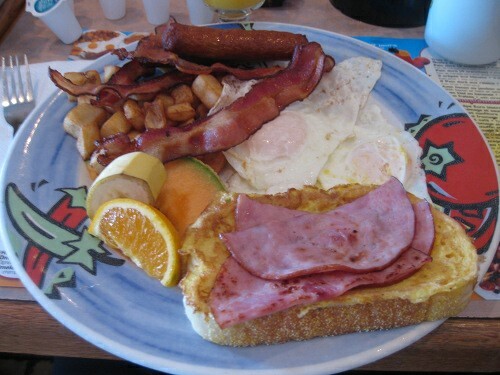 My plate was the Special Miami ($11.05), which comes served with three eggs, French toast or pancake, ham, sausage, bacon, side of fruit, potatoes and a free orange juice. The free orange juice was a very small glass and it was not tasty. In fact , was a little bitter. The eggs were well done but we’ve already established that you can’t mess up eggs. The ham was good, the sausage and bacon were tasty, and again the potatoes and fruit were uninspiring. As for the French toast, it was not good at all. The taste was missing and it really brought down the entire dish. Service was mediocre at best. Our waitress forgot some parts of our order and made an error on one of our bills. There was some confusion as to what came with what and we had a hard time tracking her down to get our coffee carafe refilled when it finally ran dry. You can find some vegetarian option on the menu; omelettes, crepes and French toast sections offer some choice although almost half the omelettes have meat in them. There is a health option, which is vegetarian and well priced at $6.76 which even tells you how many calories are in it which is a nice option. As for vegans, you are out of luck. 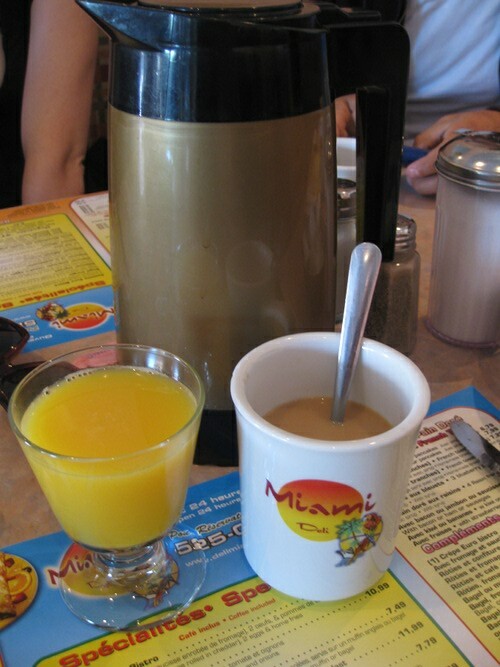 Overall, I was not a huge fan of Miami Deli; the food was not amazing, the prices should have been a little cheaper considering the fact that some dishes were not at all worth what was being charged although, the cheap $5 price range dishes are a good deal. When they charge over $10 for some stuff listed above, it’s just not worth it. Now, before I come off sounding all negative, in all fairness, if I compare it to other 24/7 breakfast places (even Picassos before it closed) it is pretty much the same: the food is not inspiring, it’s not overly tasty but it is filling and the place is convenient. Please leave a list somewhere on your site of all the places that serve breakfast 24/7. Not everyone does, but a lot of people like having breakfast at 4-5 PM when they wake up without having to make it themselves. I have reviewed 2 and one closed down.Off the top of my head there is Paolo and Suzane, Banquise and possibly Blanche Neige.